Check out Santos Holiday Apartments and Studios Availability and Reserve your Spot, Booking Calendar in Real Time. 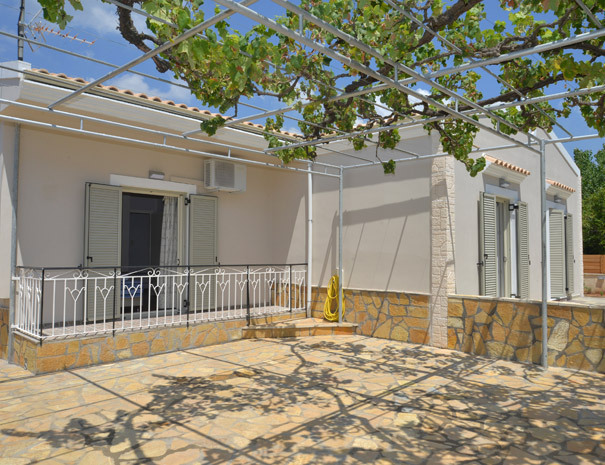 Located in Corfu Island, 100 meters from the beach. Santos Luxury Apartment no 34 can sleep four or five people, the bedrooms include King size beds that you can separate if you wish, located in Corfu, Dassia just 50 meters from the beach. A fabulous destination for famliy holidays as dassia has something to offer to everyone, whatever their ages are. Luxury Apartment no 34 in Corfu Island, is located 50 meters from Dassia beach, or just 3 minutes on foot. The bedrooms include king sized beds that you can separate to two single beds if you wish. 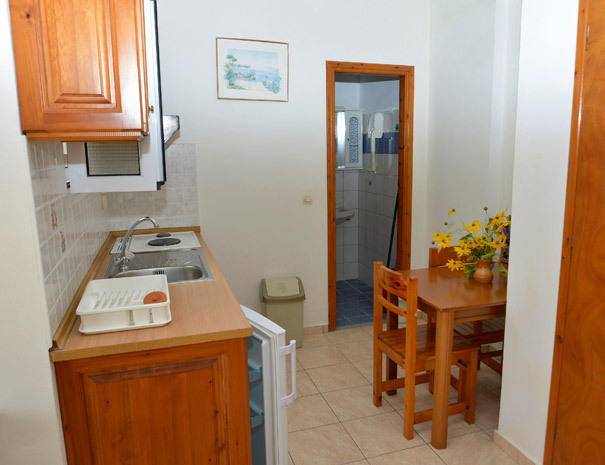 The Apartment is equipped with high speed internet access, so you can stay connected during your vacation in Corfu. The TVs contain Satellite Channels, where you can find more than 50 Channels and some Radio Channels as well. Santos Luxury Apartment no 35 can sleep four or five people, the bedrooms include King size beds that you can separate if you wish, located in Corfu, Dassia just 50 meters from the beach. 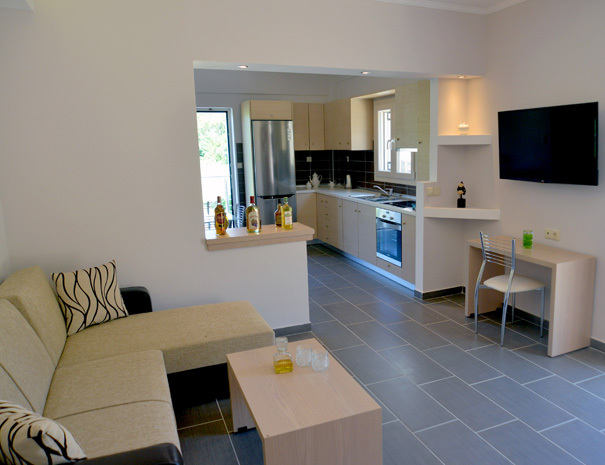 Luxury Apartment no 35 in Corfu Island, is located 50 meters from Dassia beach, or just 3 minutes on foot. Santos Studio Apartment no 31 can accommodate from two until four people, suitable for couples or families with children. 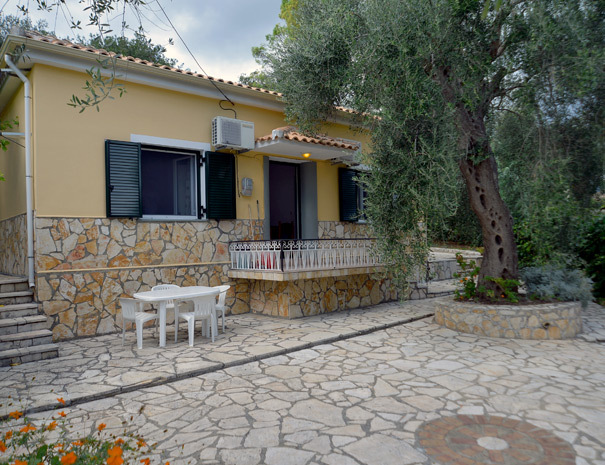 Located in Corfu, 100 meters from Dassia Beach. 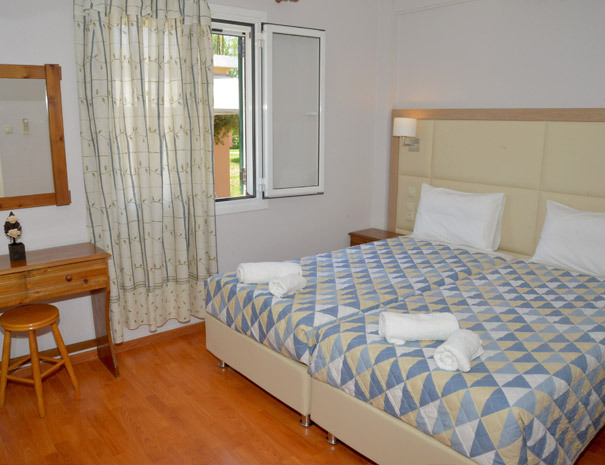 Studio Apartment no 31 in Corfu Island, is located 100 meters from Dassia beach, or just 3 minutes on foot. It includes two single beds, and one adjustable sofa bed that can sleep two extra persons. 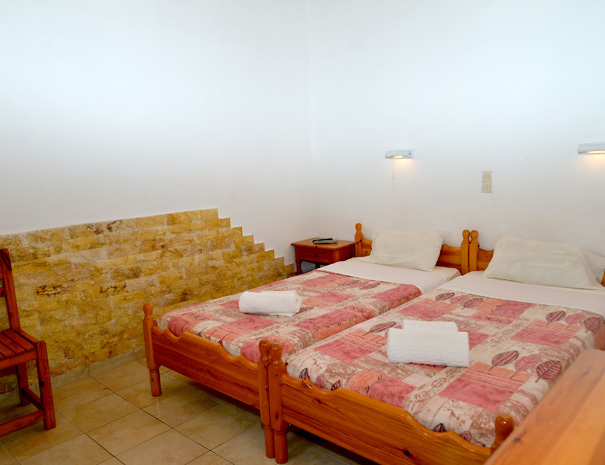 The Studio is equipped with high speed internet access, so you can stay connected during your vacation in Corfu. The TV contain Satellite Channels, where you can find more than 50 Channels and some Radio Channels as well. 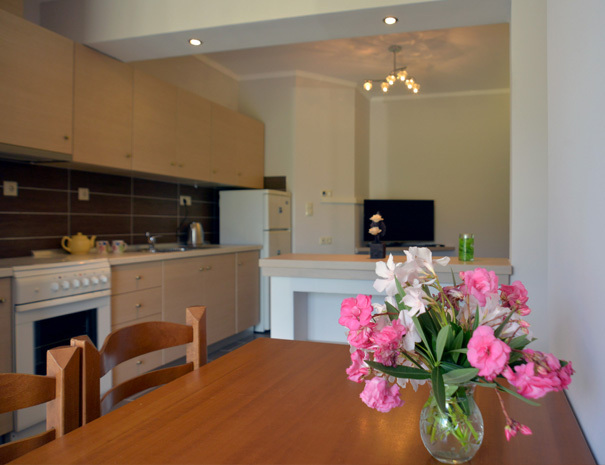 Santos Family Apartment no 22 can accommodate 4 people, consisted of two bedrooms and one fully equipped kitchen. Located in the resort of Dassia and just 150 meters from the beach. Family Apartment no 22 in Corfu Island, is located 150 meters from Dassia beach, or just 3 minutes on foot. Consisted of two bedrooms where the bedrooms include four single beds. Do not hesitate to contact us in case you have any question about the apartments, the area or anything else. We would be happy to help. If your qustion can’t wait then contact us by phone! We would be glad to help you with anything that you would like to know. We would be glad to help you if you have any question, contact us by email and we will reply as soon as possible. We would be pleased if you visit us in person, we are locted in Dassia, Corfu, Greece. See our Google Map for detailed driving directions.